The magnetic black generic compound biotite (named in honour of the 19th century French physicist and mineralogist Jean-Baptiste Biot) belongs to the sheet silicate group. Together with muscovite, this dark magnesia-ironglimmer is the most common among the mica group. Biotite is a very common rock-forming mineral found in schists, gneises, granites and rhyolites, often in association with quartz, potassic feldspars, plagioclase, nepheline, muscovite and others. Biotite flakes can be split up into very thin, highly translucent sheets. When pulverized, filtered and carefully washed biotite makes a beautiful brown color with a brilliant golden luster. In Europe, biotite is found mostly in the Ore Mountains east of Přísečnice (near the German-Czech border), in the Hrubý Jeseník Mountains, the Owl Mountains, in French region of Alsace near Saine-Marie-aux- Mines and in Norway. Other important sources for biotite are Canada and India. The biotite from Kremer Pigmente comes from Canada. The biotite, fine (#53220), 0-250 μm, is suitable for all binders which can be thinned with water and gives a nice brown-golden glossy color. Biotite flour is particularly effective as an effect in lime plaster. The biotite, coarse (#53221), 250-1000 μm, is suitable for spreaded application and as a basis for black-brown gloss effects. Suitable for the following surfaces: paper, woodchip, wallpaper, vinyl wallpaper, glass fiber fabric, gypsum cardboard, gypsum plaster, lime plaster, lime-cement plaster, synthetic resin plaster, dispersion paints. The surface must be thoroughly dry and free of dirt. Dissolve 300 grams of Tylose® in 10 liters of cold water. Keep stirring until the cellulose glue no longer floats and the mixture is lump-free. Let soak overnight. For pure white paint, add 7 kilograms of Chalk from Champagne and 4 kilograms of Kremer Color Paste – Titanium White or 3 kilograms of Titanium White to the glue solution. In order to avoid lumps, it is better to soak the pigments in water overnight. In this case, the amount of water needed for the pigments should be subtracted from the amount of water used to dissolve the cellulose glue. Add 4 liters of Dispersion K 9 for a smudge-proof paint. Covers approximately 150 m², one single coat. Adding 500 grams of Glass Flakes, medium (e.g. #59851) creates a nice glittering effect. Instead of white pigments, you can also use other color pigments for this recipe to get different colors of wall paint. Add a small amount of pigment (between 50g and 500g) for a nice colored touch in your wall paint. Or use 10 kilograms of a pigment suitable for acrylic dispersions instead of the mixture described above. Very fine pigments, such as synthetic-organic pigments, may need more binding medium. 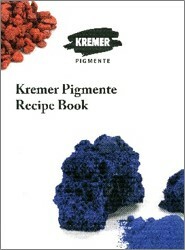 In this case, the amount of pigments in the recipe above should be reduced. It is necessary to test whether or not the amount of binding medium is sufficient. If the paint shows chalking when dry, add more binding medium. If necessary, add Orotan 731 K (#78032) as a wetting agent. Cadmium pigments are not recommended for wall paints! 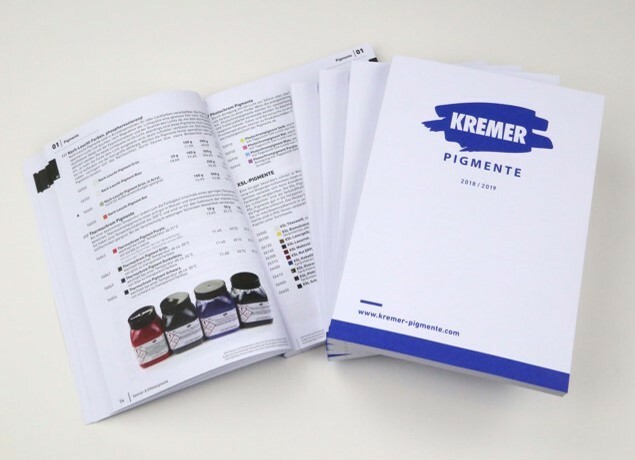 The recipe "Wall Paint: smudge-proof, opaque, white (Interior Walls)" can also be found in our new Kremer Pigmente Recipe Book. The chapter wall paints contains 12 different recipes for the design of walls and for works of art on solid picture carriers. In 5 further topics you will find recipes for watercolor, emulsion paint, acrylic paint, oil paint and others. 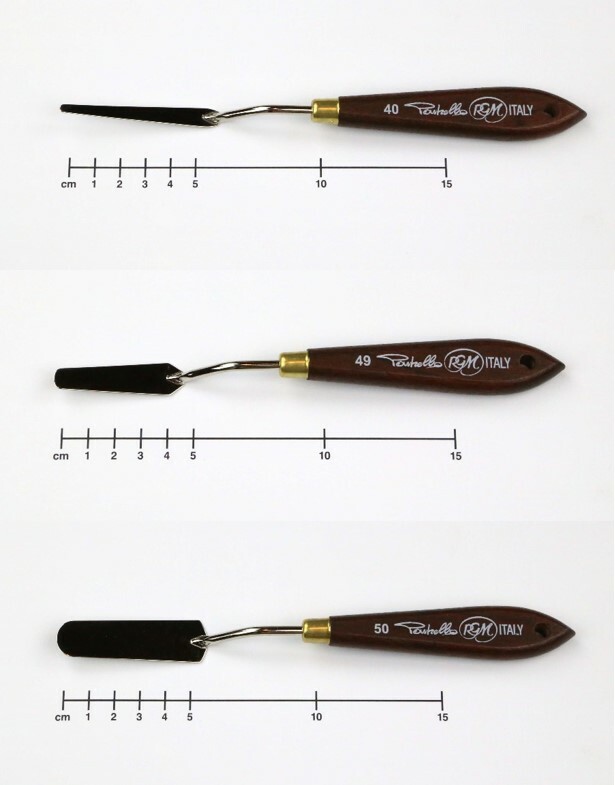 The blade is made of tempered steel and ground manually to ensure an optimum flexibility. The glossy finishing provides an excellent spreadability of the color. On the occasion of the 100th anniversary of the founding of the Bauhaus in Weimar, ARTMAPP's four-part series "Kremer's Farbenwelt" presents a contribution to colors used in architecture from the early 1920s. We are happy to send you a copy for free directly to your home! Just send us a short message to info@kremer-pigmente.com. Please note that the catalog will no longer be delivered automatically! 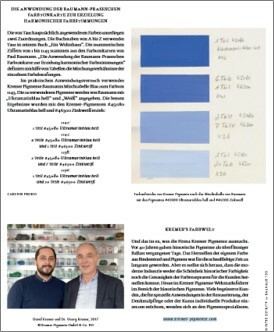 Or just download our German Catalog via PDF.